Mr. Sun Yigang, male, Han ethnic, was born in March 1961 in Qingdao, Shandong Province. He is a research librarian. He joined the Communist Party of China (CPC) in March 1984. 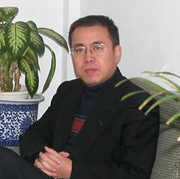 He graduated from Department of Optics, Shandong University with bachelor degree in July 1983, and graduated from Computer Science and Engineering Department, Beijing University of Aeronautics and Astronautics with master degree in March 1996. He joined People's Liberation Army in July 1983 after he graduated from university, and had successively worked in Institute of Artillery Equipment and Technology, General Staff Department, and Weapon System Integrated Demonstration Research Institute, General Armament Department. He was transferred to the NLC in July 2000, and then had successively acted as director of NLC Information & Network Department, vice-general manager of China Digital Library Corp., Ltd, director of NLC Scientific Research Division, Centennial Events Office, Computer & Network System Department, and General Office. He was appointed NLC Director Assistant in November 2010. He was concurrently appointed Director of the NLC New Technology Research Center (Vice Bureau-level) from July 2013 to March 2016. He was appointed NLC Deputy Director in March 2016.